Really fantastic food, lovely atmosphere. Everything comes up at different tines, flavours on sauces of each dish were amazing. Lots of Thai people eating and stopping for takeaways. Local food and especially chicken satay and pad thai are delicious, and price are very competitive. 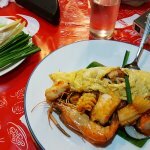 For instance see food pad thai is around 100 THB with delicious fish and seafoods., and fresh vegetables. Pay attention try to go early, because after 19:30 is can be full, and you might wait long to get your food, as there are also a lot take away, and they prepare completely the food on the order one by one. Attention It's food street don't expect to have charming place. Second advice don't try mango shake there is too much water, but watermelon shake is delicious and very large. Been to Chaiyo Kha Moo? Share your experiences!